Chorispora tenella (Pallas ) DC. Also Called: Purple mustard, tenella mustard, crossflower. Stems: Erect, much-branched, rough, sparsely to moderately covered with minute gland-tipped hairs. Leaves: Alternate above, nearly opposite below, simple, short-stalked, oblanceolate to lanceolate, 1.2 to 3.2 inches long; surfaces with minute gland-tipped hairs; margins wavy to coarsely-toothed. Flowers: Sepals 4, erect, 1/8 to 1/4 inch long, in two opposite pairs; petals 4, 1/4 to 1/2 inch long, diagonal to sepals, bluish-purple to pale lavender or nearly white. Fruits: Pod, 1.2 to 1.8 inches long, curving upward, slightly constricted at intervals, several to many seeded, minutely covered with gland-tipped hairs; beak slender; seeds rectangular, one side flat and smooth, other side rounded. Habitat: Waste areas, roadsides, fallow cultivated fields, disturbed sites. Origin: Introduced from Russia and Asia. 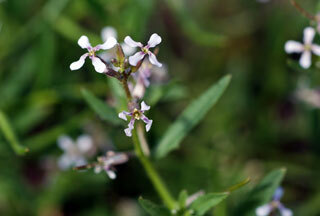 Forage Value: Consumption of blue mustard can cause dairy cattle to produce off-flavor milk. Uses: Ground-foraging birds and small mammals eat the seeds. Comments: When crushed, the foliage of this weed has an unpleasant odor.